The Occupational Safety and Health Administration (OSHA) adopted massive changes to its Hazard Communication Standard (HCS or Hazcom) effective May 25, 2012, updating chemical information, labeling and training requirements that had been in place since the 1980s. These revised requirements conform U.S. requirements to international guidelines under the U.N.-sponsored Globally Harmonized System of Classification and Labeling of Chemicals (GHS). Recognizing the extent of these changes, OSHA provided multi-year compliance phase-ins for employers whose workers manufacture, distribute or use chemicals (I’ve previously blogged about the changes here, here and here). The next such deadline is December 1, 2015, when distributors must only ship containers that meet the latest labeling requirements – so if you work for an employer that’s an end user of chemicals, all containers entering your facility must meet these requirements rather than the pre-2012 requirements. What Labeling Requirements Now Apply? Supplemental Information, IF ANY. The label producer must identify the percentage of ingredient(s) of unknown acute toxicity present in a concentration of ≥1 %. It also may provide additional instructions or information it deems helpful, may also list any hazards not otherwise classified (“HNOC” in OSHA usage). The deadline to explain this updated labeling in Hazcom training was December 1, 2013, so employees should be familiar with these requirements already. 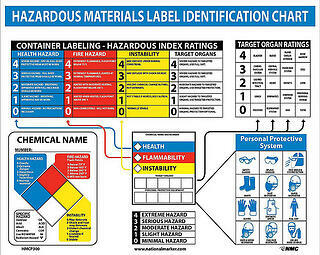 Does each Hazcom program already meet the GHS standards provided in the revised Hazcom, including updated labeling? Does the organization review newly purchased chemicals to verify that they are properly labeled, including with Hazcom requirements?